According to KXTV in California, Chuck Kunellis was surprised this month when two letters his father wrote to his wife almost seventy years ago were finally delivered to Chuck’s home. Chuck’s father wrote the letters while stationed in Italy during World War II. 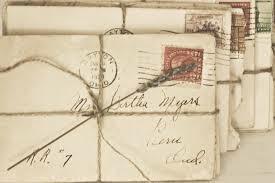 The letters had been lost in the mail and through the work of a Good Samaritan were finally delivered to Chuck. Whatever your situation with your earthly father, you always have letters that are available to you from your heavenly Father. Simply stated, those letters are found in the Bible. God knew that throughout time all of us would need letters of encouragement, direction, and love. Scripture provides us with God’s ageless, absolute truths. Are you feeling discouraged? Read Psalms. Looking for direction? Read Proverbs? Looking for love? Go to the book of John and learn just how much God really loves you. In an article from Christianity today, LifeWay Research surveyed more than 2,900 Protestant churchgoers and found that while ninety percent of those surveyed desire to please and honor Jesus in all they do, only nineteen percent personally read the Bible every day. How about you? How are you doing with the letters from your heavenly Father? Are you reading daily? If you’re struggling with your reading, just remember that reading God’s word is not an obligation. It’s not a chore that you must complete and cross off your list. Your reading is a chance to learn more about God. It’s a chance to hear Him speak to you through his letters. The letters He prepared just for you. Deuteronomy 7:9 tell us, Therefore know that the Lord your God, He is God, the faithful God who keeps covenant and mercy for a thousand generations with those who love Him and keep His commandments. Keep reading your Bible and see what God has written just for you. It would be a shame to leave a letter from God unopened. Some of my thoughts today are from a book titled, Thinking For A Change written by John Maxwell. In that book Maxwell tells the story of two sisters. One sister just got word that she was accepted to the college of her choice. She was so excited to have earned the opportunity for a future career. The other sister leaned over to her mom and said this, I feel so sorry for my sister. She has to go to school four more years! This story illustrates the underlying foundation of the book. Successful people think differently than unsuccessful people. In our story, one sister thought about the wonderful opportunity she had been given to attend college and start a career. The other sister thought about all the time, effort, and work it would take to get through four years of college…two totally different ways of thinking. What do you think about every day? Do you even take time to deliberately think about the future or are you just trying to get through the day. Maxwell said this about the power of thinking. If you aren’t doing it yet, may I encourage you to spend some time each day deliberately thinking? A good way to get started is to spend some time at the end of each day reflecting on your day. Examine what was successful in your day. What decisions did you make that led to successful outcomes? What decisions did you make that led to negative outcomes? How could you have made your daily decisions better? If you will take fifteen minutes at the end of each day and reflect on the decisions you made during that day, you will learn tremendous lessons that you can use tomorrow. Some of you may remember an old movie called Groundhog Day. In that movie the main character continued to live the same day over and over again. I hope you aren’t trapped in a similar situation. If you feel like you are simply repeating your workdays, break free by thinking deliberately each day, learn from the lessons of the day that God is teaching you, and apply new ideas to your life. Former General Electric CEO, Jack Welch once said this. 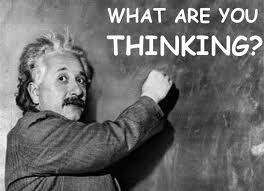 99.9 percent of all employees are in the pile because they don’t think. Don’t be one of many struggling in the employee pile. Spend some time thinking and live the exciting, creative life God has planned for you.